This is where in the world I am. Note: The SPOT mapping service has been deactivated as of October 6, 2014 and no longer works. See special custom Google map below for a plot of my progress day-by-day. Special custom Google map showing Halfmile trail path (for 2014) and annotated with my daily SPOT location/notes. This was developed by Justin Watt, my son, and partially described at Following Dad on the PCT. It was used to coordinate meeting me on the trail. For the above custom Google map, here is an online conversion from latitude & longitude to Halfmile trail mile tool. The results are to be entered into the Google spreadsheet below. Internally it includes Halfmile’s 2014 KML information for each trail mile and half-mile. For the above custom Google map, the input is located in a Google docs spreadsheet. You insert the latitude & longitude, and trail mile location in the spreadsheet using your (1) SPOT latitude & longitude, and (2) the Halfmile trail mile location from the tool above. The mile location can be entered manually if no SPOT location was received. One entry per day containing: the day number, latitude, longitude, actual trail mile, expected trail mile, miles banked (expected vs actual), actual daily mileage, 5-day average, and notes. 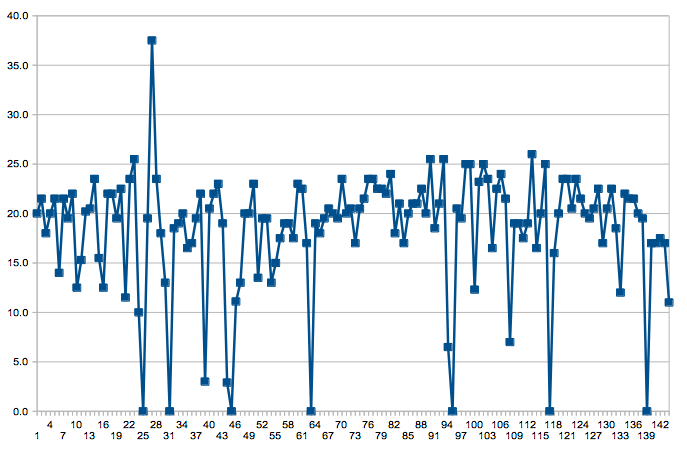 Using the above Daily Mileage spreadsheet the number of miles hiked per day were calculated and plotted. The following are some of the key days based on the plot. The seven zero-days and several nearo-days can been seen clearly. Day 25 was a zero day in Agua Dulce, California. Day 27 began hiking with Bilbo. It was the longest day (37 miles) because Bilbo and I road-walked the detour around the Powerhouse fire closure. That is, we walked over 20 miles of road which skipped 37 miles of trail. Day 30 ended hiking with Bilbo. I went to Tehachapi for resupply and he went to Mojave. Day 31 was a zero day in Tehachapi, California. Day 32 left Tehachapi, California, with the goal to get to Justin at Tuolumne Meadows on June 8. Day 39 was a nearo, my arrival at Kennedy Meadows, and the start of the Sierra Nevada mountains. Day 45 was a zero day in Independence, California. Day 54 was my arrival at Tuolumne Meadows, and began hiking with Justin. Day 62 was our arrival at South Lake Tahoe, and ended hiking with Justin. Day 63 was a zero day in South Lake Tahoe with Kathy, Stephanie and Justin. Day 75 was the PCT midpoint. Day 79 began hiking with Nobody’s Friend, and our departure from Burney Falls State Park. Day 93 was the California / Oregon border. Day 94 was our arrival in Ashland. Day 95 was a zero day in Ashland, Oregon. Day 99 was our arrival in Crater Lake National Park, and ended hiking with Nobody’s Friend. Day 108 was my arrival in Sisters, Oregon and began hiking with Matthew. Day 116 was our arrival in Cascade Locks, Oregon, and ended hiking with Matthew. Day 117 was a zero day in Cascade Locks, Oregon. Day 139 was a zero day in Stehekin, Washington. Day 140 to day 144 reduced my mileage to meet Katie at the northern terminus on September 6.